Buying a steering wheel lock for your car is a small investment that you can make to better secure a larger investment, which is your car. It's obvious that car thieves always find a way to defeat many of the newest tech gadgets that should protect cars, so a solid piece of metallic steering lock often remains your last level of security for your vehicle. In this steering wheel locks review, you'll get a list of the best locks out there, plus a buying guide to help you make a better buying choice. The Club is synonymous with steering wheel locks and this 1103 LX Series takes that legacy to a whole new level. It also comes with The Club's simple and helpful pull-to-lock automatic system. Simply hook one side to the steering wheel and pull the other end to lock it, and that's it. No keys, no fiddling, no time wasted. Just pull it to lock it. You can also open the lock with a key to pull and lock it more easily. 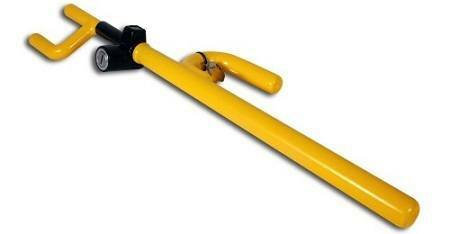 This steering lock resists all types of tampering, such as hammering, sawing, prying, and freon attacks. Although this silver color is not very noticeable from far away, there are blue and red options, which are more eye-catching. It fits most steering designs easily but will only fit steering wheels that are 18 inches or shorter. This package also includes a 1-year manufacturer warranty. If you've got the money to spend and you simply want the best steering wheel lock for your vehicle, then here's an impressive product with a unique design, that you need to take a closer look at. 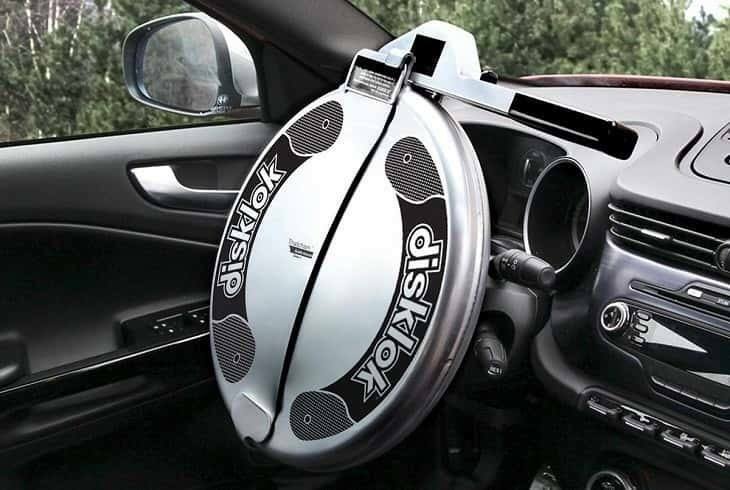 The Disklok is a unique circular steel case that you close around the steering wheel and lock it in place. It then spins around the wheel, preventing any potential thief from steering the car. 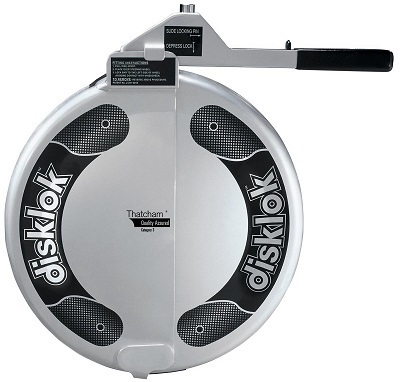 One thing about the Disklok is its price. It is way higher than that of other steering wheel locks, but if you can afford it, then it's a great investment that you can rely on. The package comes with three keys and a 3-year warranty, which is impressive. It's also available in three sizes from 13.7 to 17.3 inches, so you need to get the size that best fits your car's steering wheel. This offer is for the medium size. This steering wheel lock has been in the market for so long that it's a truly tried and tested product. This makes it a reliable club that's additionally easy to use. Just set it and pull, and its patented locking system locks into place. No need to fumble with the keys or waste extra time just to secure your vehicle. One downside of its long history is that some seasoned thieves know just how to bypass it since it's a popular wheel lock. It comes with a 1-year warranty anyway and includes a 1,800-dollar insurance deductible in most states of the U.S.A. It fits most cars, vans, and trucks with steering wheels between 10 and 19 inches in diameter. Here's the first and only pedal to wheel lock in this review, and it's both affordable and effective. 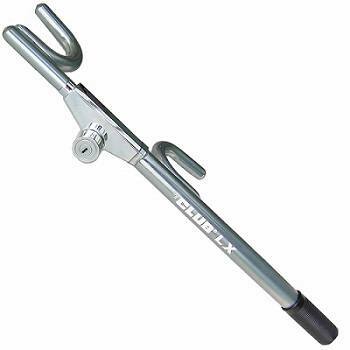 It also comes with The Club's easy-pull self-lock, making it a pleasure to use. Targeting a pedal and the steering wheel together makes this one of the best anti-theft steering-wheel locks out there because it both prevents the turning of the wheel and the use of either the gas or the brake pedal. It has a universal design, which makes it usable in all types of vehicles from sedans to trucks and vans. It will lock in any car with a 22.5 to 30-inch different between the pedal and the steering wheel. Finished in bright red, this lock provides a maximum of visual deterrence to potential thieves, although it does not protect against airbag theft. It's backed by a 1-year warranty anyway. With its five-digit code system, this steering wheel lock presents the potential thief with up to 13 million possible combinations, and this is a huge deterrence. It also makes it unnecessary for the vehicle owner to carry a key around. Simply scramble the lock and your car gets secured, and when you get back, simply select the right code and it opens up again. This system is without a doubt, one of the best car security locks for those who prefer everything keyless. It fits a range of steering wheels from 7 to 15.5 inches and includes a padded handle that makes it a good self-defense weapon as well. Two cons of this offer are the 60-day warranty period, which is relatively short, and the fact that an expert lock pick or thief can bypass its combination lock. 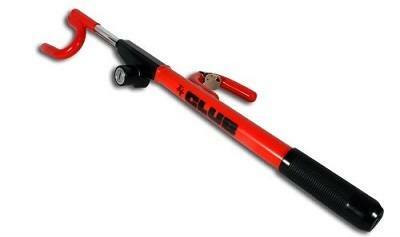 The Club presents the Twin Hooks 3,000 here, which is another top-rated steering wheel lock. It features a twin hook design for grabbing the steering wheel more solidly. This makes it harder for thieves to break and it improves the overall security. This club is also brightly colored in yellow, greatly improving its visibility and function as a deterrent. Like most other locks from The Club, this one is made of cro-moly alloy steel as well, a metal that is tough enough to prevent sawing, hammering, and freon attacks. On the downside, it comes with only a 90-day warranty, which is okay but rather short. It's also guaranteed for up to $500 against the owner's insurance deductible, where applicable. If you're on a budget, then this offer might be of interest to you. It's well-made and very tough, but it comes at a very low price, which makes it one of the best steering wheel locks for budget shoppers. This Club 900 wheel lock gets made using sturdy tempered steel, which makes life difficult for thieves. It's then covered in vinyl to protect it from scratches and to make it durable. Its bright yellow is very visible from far away and its simple design gives it a universal fit for all kinds of vehicles, including sedans, SUVs, trucks, and vans. You should note that it only locks on to the steering wheel and does not hook on to a pedal. It also lacks The Club's keyless locking technology, but for its price, you just can't complain. 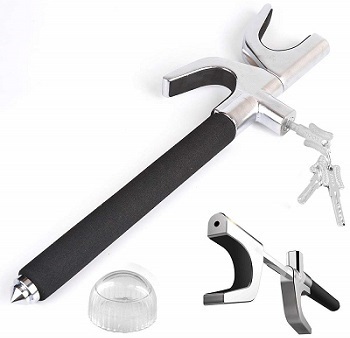 This MonoJoy offer is a multi-functional automotive tool that combines a steering wheel locking feature with a self-defense tool and a glass breaker for emergencies. As a car steering wheel lock, it comes with a B+ grade lock cylinder and features a pick-proof locking mechanism with laser cut keys that are impossible to duplicate. It comes with a self-locking feature and will stretch from 17.7 to 28.7 inches. The frame comes from hardened steel and the lock will rotate if you try to drill it. This lock's handle includes a soft cushion to make it easier to handle and to defend yourself if the need should arise, and at the lower end of the handle, you'll find the hammer point that makes this tool also work as a glass breaker. Here's another club from The Club and this time, it's the 1234 steering lock, designed to fit all types of vehicles with steering wheel diameters ranging from 11 to 20 inches. It's made using The Club's cro-moly steel for strength and durability, then coated with vinyl for more protection and durability. This steering wheel lock will additionally resist all standard prying, sawing, hammering, and freon attacks. Unlike many steering wheel locks, this one comes with a black finish which makes it less visible to potential thieves. It also lacks the automatic lock that many other Club locks come with. The Club backs it with a 90-day warranty, which isn't much, but it's also guaranteed for up to $1,600 against the potential owner's comprehensive insurance deductible in states that allow it. This last steering wheel lock takes an entirely different approach from most of the other offers in this review. It measures 14 inches in length and has a width of just 7.3 inches. Here, you lock a part of it on to a part of the steering wheel and a part of this lock extends beyond the dashboard, preventing a potential thief from steering the car because the dash will block the lock's extended bar from moving freely. Like many good steering locks, this one comes with a vinyl coat for protection and durability and it's additionally colored bright yellow, which makes it more visible and a better deterrence for potential car thieves. The package comes with two keys, which are additionally very hard to duplicate and EforCar backs it with a 1-year warranty. Its design, however, can't offer any protection for airbags, but it's a great steering wheel lock for its price. Steering wheel locks have come a long way since the 1920s when they gained popularity. These days, advancements in technology have made different types of locks possible. In order to make the right choice, therefore, you'll need to understand the differences between the different locks out there and the important features to consider when choosing. The first major difference between steering wheel locks is their design and this has led to three major types in the market. They are the traditional, the wheel to pedal, and the enclosed steering locks. Here's a closer look at each type. Traditional Lock. 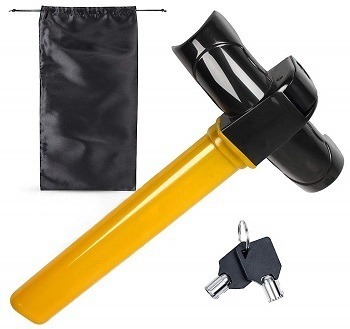 This is the most popular type of steering wheel lock that you'll find and simply includes a metal bar with hooks to attach it to the steering wheel. These hooks come in different shapes and designs, but the important point is that this is a bar that locks across the steering wheel. Wheel to Pedal Lock. This type of lock combines the traditional bar lock and an extra pedal lock to secure two systems in the car and make it less likely to get stolen. 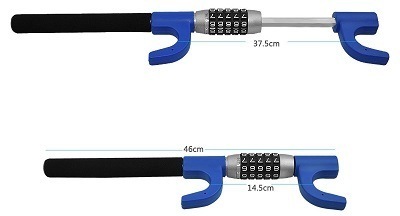 This type of steering wheel lock is less popular than traditional locks, they offer a higher level of security, but also need more time to set up. You lock the pedals and connect it to the bar that locks the steering wheel, and that's it. Enclosed Lock. This least common type of lock encloses the entire steering wheel with a hard steel shell, which means that they're both heavy and bulky to handle. On the brighter side, they offer a higher level of protection than bar locks. Buying a steering wheel lock is one thing, making sure that it fits is another. The truth is that most locks that you'll find will fit most car steering wheels, except for the few with unique or exceptional designs that will not fit. You should, therefore, check to make sure that any lock that you're about to buy is either universal or guaranteed to fit your specific vehicle. This is more of a deterrence tactic. The more colorful or visible that your car's steering wheel lock is, the more easily a potential thief will see it from far away and may get discouraged and try to find another car to steal. So, it's always better to get a lock that's as eye-catching as possible, because it increases your vehicle's overall security and is better than even the best steering wheel lock with alarm, which a potential thief doesn't see at first. 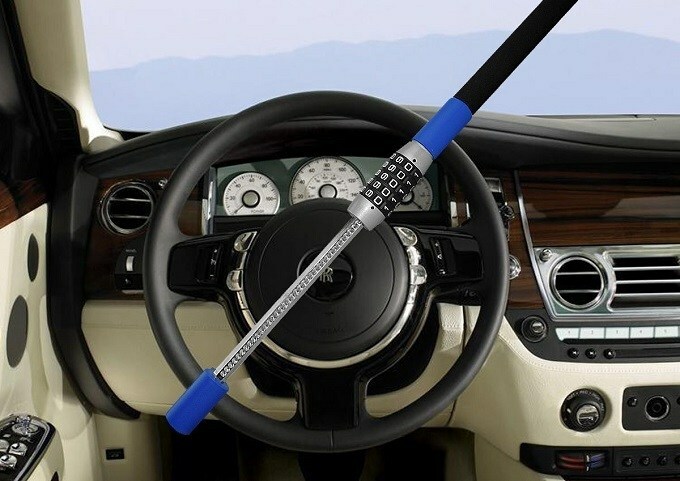 Another security consideration is to buy a steering wheel lock made from the toughest material possible. The advantage is that it will take any potential thief a long time to try to saw through it or to break it in any other way. Steel alloys and hardened steel locks are the best you can get at the moment. They make life tougher for any potential thief, in the hope that they may get discouraged, disturbed, or simply lose interest because of the material's resistance. We've reached the end of this steering wheel locks review and you've seen all the great offers out there in the market. From the traditional designs to more thought-provoking and ingenious styles, you can see that there's a steering wheel lock for every one of us. You'll have to choose the offer that best suits your vehicle by yourself anyway because there's simply no best steering wheel lock and you're the only one that knows what best fits your ride.